I'm not gonna lie, this week has been a tough one - what with apocalyptic weather, missing every single event and it being two days to Pay Day - I'm not a happy bunneh. That is why we're here though, right? To release the Kraken and restore the equilibrium. IN THE LADIES' PUBLIC TOILETS!? And that's them, with a little shout out to one of my fave Dudes Dusty Hunter on #4 there, because I know, for a fact, that that irks him too. 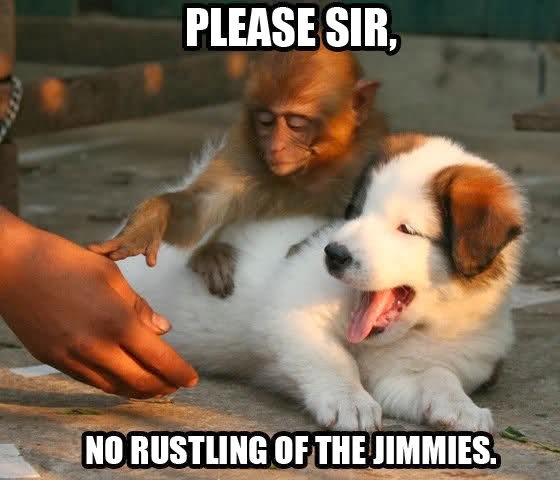 Tell us, what's been keeping your jimmies a'rustle this week then? People. People are annoying me today. Some human beings are awful stupid. STUPID. Yet another awsome jimmy russler post!my own jimmies being russled by two individuals i share an office with who eavesdrop on my private conversations that have nothing to do with them,and then stick their oar in !! Grrrr. Seriously? I agree with sue on bloggers not disclosing sponsored posts,really irritating and tarnishes credibility. I have to stop reading these posts when I'm somewhere that I shouldn't be laughing out loud. In the same vein as number 1. All those tweets that say x people followed me, y people unfollowed me or x people aren't following me back. Who gives a damn how many people aren't following you back, except you!